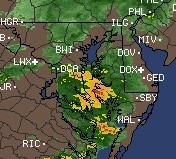 Washington, D.C. was just spared, but fireworks in Rehoboth Beach and Ocean City started at 8:30 p.m. this July 4th -- an hour early than planned -- because of approaching thunderstorms. above: Intellicast RADAR image as of 7:45 p.m. July 4th. A few fireworks watchers brought umbrellas and rain gear, but not many. Plenty got wet if they did not find cover. 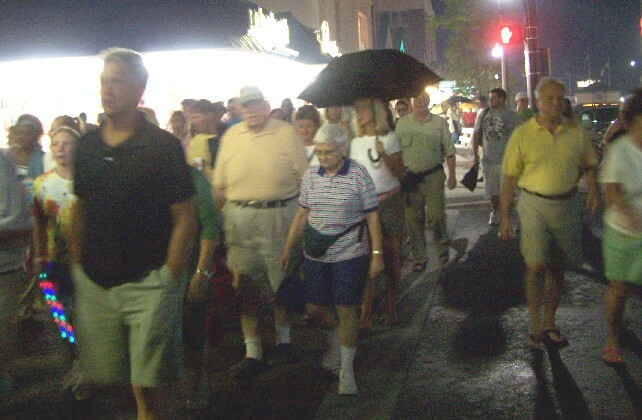 Even before the grand finale at 8:45 p.m., an onslaught of visitors began an early exodus. Rehoboth, Bethany and Ocean City police directing traffic reported gridlock and struggled with frustrated visitors as they got soaked by rain and threatened by lightning. During the exodus, traffic was so bad, paramedics already in Rehoboth were forced to park and walk to a medical emergency in the ocean block of Wilmington Avenue. Police even talked about having the ambulance drive up on the boardwalk to reach the patient at the Normady Apartments, but that didn't happen. Some visitors waiting for the park and ride buses in front of city hall during the downpour became disorderly, and police were assigned to monitor the bus loading. A stray dog ran up to a Rehoboth Beach police officer toward the end of the fireworks and stayed with him. 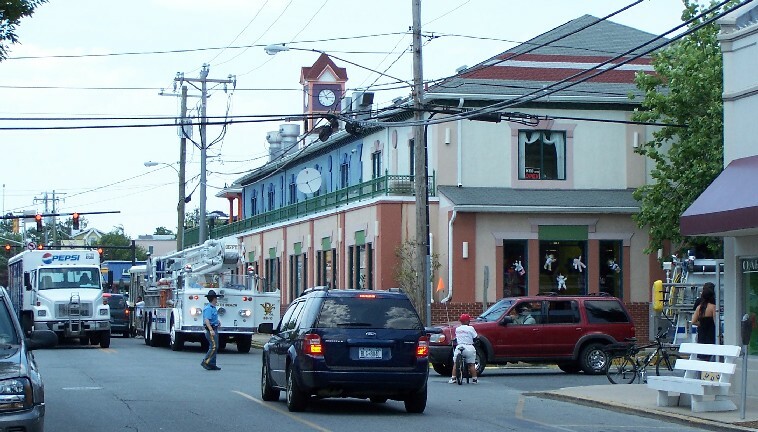 Ocean City had similar problems, and even experienced flooding. Baltimore Avenue and Philadelphia Avenue were described as "parking lots" as portions of Baltimore Avenue south of 20th Street became "landlocked." 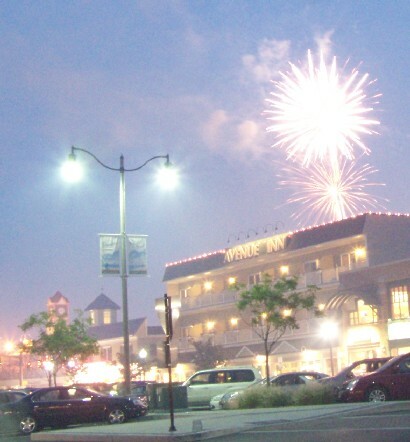 In Rehoboth Beach, the fireworks set-up began on the evening of July 3. Rehoboth Beach Patrol Capt. Kent Buckson, below, drove the Gator and helped haul fireworks gear to the launch site in front of the Star of the Sea Condo. Seasonal police officers guarded the site. The beach resorts were packed this weekend, and people fell into queue most everywhere they went. 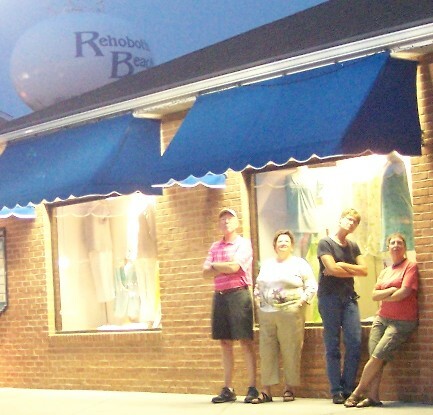 More than 20 people waited in line for quarters early Friday evening at the Rehoboth Avenue and First Street change machine. And around 7:15 p.m. Saturday, more than 30 wait to enter an already-packed Aqua Grill, a popular Rehoboth Beach nightspot on Baltimore Avenue. Rain returned again on Sunday. Those attempting to leave town around 3 p.m. found themselves in more lines with rolling back-ups on Rehoboth Avenue and Route 1. WBOC-TV LIVE FROM REHOBOTH AVENUE AND THE BOARDWALK! WBOC was live from the Rehoboth boardwalk for the evening newscast on July 4th. This 1991 Enstrom 280FX flew over Rehoboth early Friday evening. It belongs to Horizon Helicopters of Newark, Delaware. The company claims to be Delaware's only full-service helicopter operation. Horizon says it uses the Enstrom for training, photography, tours and demos. 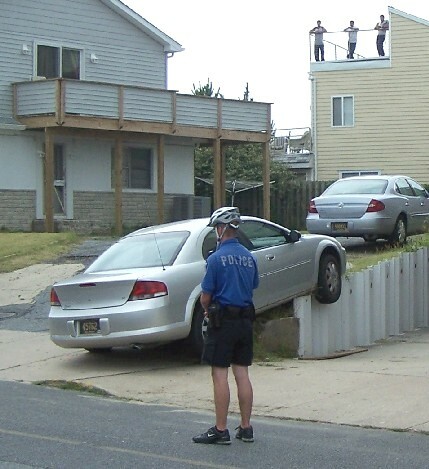 A car had been left parked on a retaining wall on Philadelphia Street near the boardwalk from the previous evening. Police received a call around 11:25 a.m. Saturday asking that it be removed. The car was parked with one wheel hanging over the wall. A Coastal Towing driver, called to remove the car, told the officer it had to be removed using a flatbed truck. While police waited for the flatbed, the car's operator returned. Police reportedly told him it would be towed to the impound lot and ordinary towing rates would not apply because it required special removal. 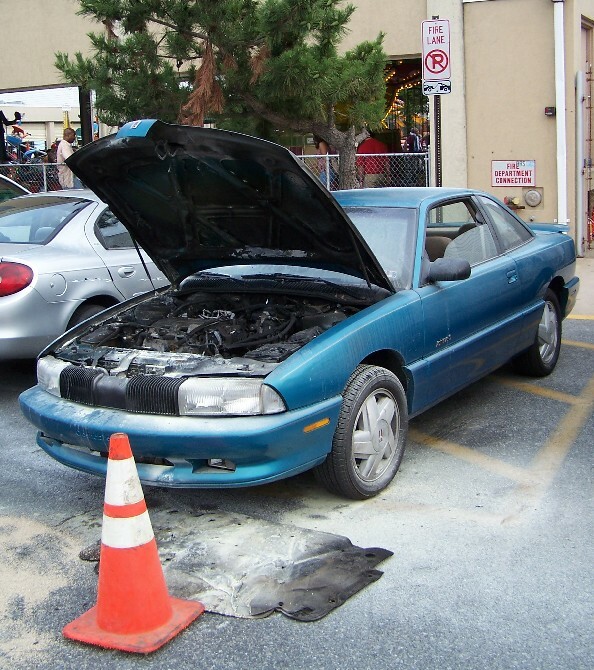 That was not the only sloppy parking job Rehoboth Beach police handled this holiday weekend. On Friday evening, officers arrested the driver of a vehicle who jumped a curb and sideswiped this parking meter in front of 24 Brooklyn Avenue. 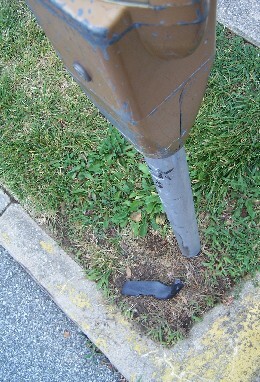 The piece of black plastic broke off the vehicle. Police allowed a woman who was with the man to drive away with the vehicle. The impact loosened the meter pole, but did not knock it down. 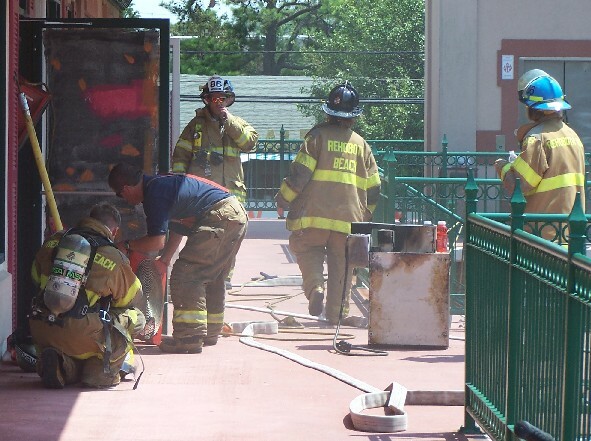 Firefighters responded to First Street Station at 70 Rehoboth Avenue around 2:25 p.m. Thursday for a smoke investigation. Minutes later, firefighters confirmed smoke coming from a unit on the second floor across from Hooters and requested back-up from Lewes and Bethany fire companies. But they had the situation under control within 20 minutes. A Hooters employee said the unit is used for storage by the White House/Black Market clothing store which is on the first floor. Eastbound Rehoboth Avenue, First Street and Wilmington Avenue were shut down for about 30 minutes. The engine compartment of this blue Oldsmobile caught fire around 2:10 p.m. Friday on Delaware Avenue in front of Funland. The fire was quickly extinguished with a dry-chemical fire extinguisher. Firefighters spread absorbent to catch leaking fluid. Pedestrians were injured on Route 1 on Thursday and Friday. A Pennsylvania man was struck by a Toyota early Thursday on Route 1 in front of the Rehoboth Car Wash. 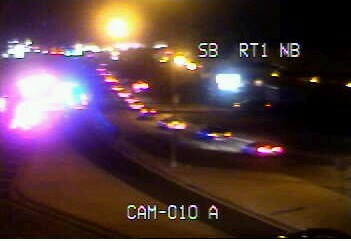 It happened around 12:05 a.m. on the right-most northbound lane coming from the merge of Rehoboth Avenue Extended. A state police news release says a second vehicle was in front of the Toyota when it made an abrupt lane change to avoid hitting the man. The Toyota's driver suddenly spotted the man walking eastbound on the roadway into his path. The Toyota struck the man, who police have identified as Joseph Steward, 60, of Ridley Park, Pennsylvania. Steward was flown by state police helicopter to Christiana Hospital where he was treated for cuts to the head and a shoulder injury. His injuries are not life threatening. The driver of the Toyota was wearing a seatbelt and alcohol is not a factor on his behalf. The pedestrian was not carrying a flashlight and there was no crosswalk where the crash occurred. State police say alcohol use on behalf of the pedestrian was unknown when they issued the news release. Fire-poilce shut down the northbound lanes of Route 1 just south of Rehoboth Avenue Extended (below). The state police helicopter landed on the roadway north of the accident scene, while traffic passed on the service road. 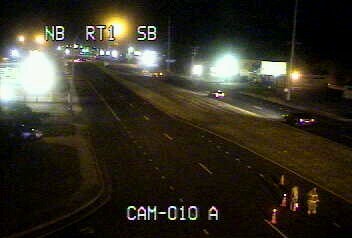 Images from DelDOT traffic camera. Another man was struck by a car on northbound Route 1 in the area of the Midway Shopping Center around 8:35 p.m. Friday. He was taken to Beebe Hospital with a head injury which did not appear to be life threatening. The car’s speed was estimated at about 40 m.p.h. 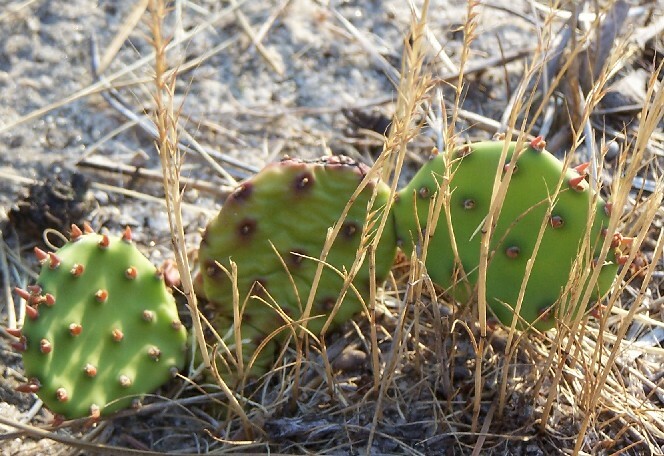 These are Opuntia humifusa cacti, commonly known as the Eastern Prickly Pear, which are often found along the Delaware shore. Wikipedia says they are the only native cacti found in the northeastern part of North America.